E-Zee Cut® Washaway 1.2 oz. is a soft and sheer stabilizer that dissolves easily in water. It is ideal for lace, patches, emblems, appliqué, napkins, fleece and delicate fabrics. Perfect for applications where the back side is visible and requires that the stabilizer be removed completely. Also used for Cutwork Embroidery. Be sure that your hands and work area are completely dry before handling. Cut a piece from a roll of E-Zee Cut® Washaway to fit your hoop size. Hoop by placing the stabilizer underneath the garment or hoop alone for lace. Embroider the design and remove the embroidered item from the hoop. Trim the loose, excess stabilizer with a sharp pair of scissors, leaving some excess stabilizer around the outside of the design. Dissolve by submerging in liberal amounts of warm water and apply slight agitation. You may also run the embroidered item through a delicate wash cycle. Due to irregular water conditions, it may be necessary to repeat this step. Store unused E-Zee Cut® Washaway in a dry, airtight container. To avoid nicking the fabric when trimming away the stabilizer, hold the stabilizer while trimming and let the garment drape. Be sure to face it so you can see both the edge of the design and the fabric while you are trimming. Helpful Hint: To avoid nicking the fabric when trimming away the backing: Hold the backing while trimming and let the garment drape Be sure to face it so you can see both the edge of the design and the fabric while you are trimming. 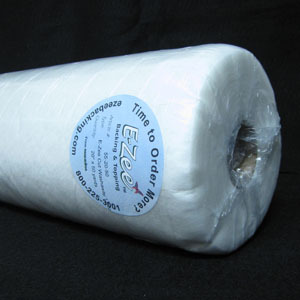 Store unused E-Zee Cut ® Washaway stabilizer in a dry, airtight container.